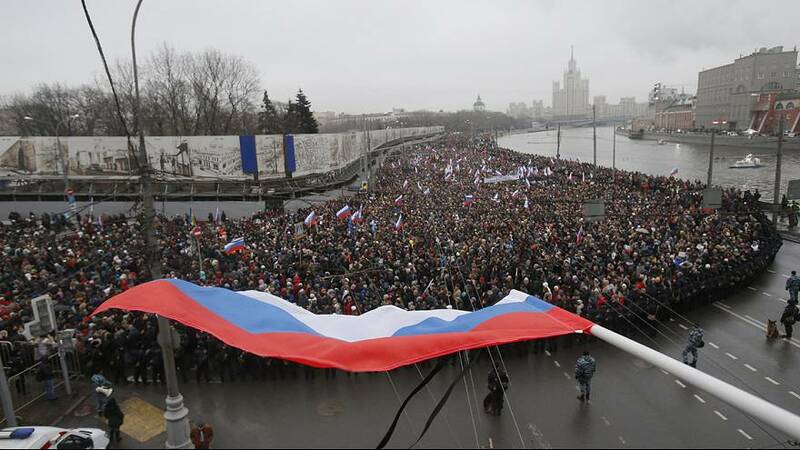 Tens of thousands have turned out for a memorial march in Moscow after the murder of prominent Russian opposition figure Boris Nemtsov. The former deputy prime minister and fierce critic of the Kremlin was gunned down as he walked home with his girlfriend on Friday night. The killing took place just 200 metres from the Kremlin, and came just before Nemtsov was due to lead a big rally against the war in Ukraine. That rally transformed into the memorial march, which has been approved by the authorities. Investigators are examining security footage recorded at the time of the killing, some of which has been shown on Russian television. Nemtsov is seen walking with his girlfriend and another person is then seen running from the spot and getting into a car that stops nearby. Russian authorities are promising a full investigation to hunt down the killers, but the opposition is voicing scepticism that the truth will ever be uncovered.